Hi, This is Motaki. She is 11 years old in this photo camping in New Hampshire. She died on March 23, 2012 at the age of 13 ½ years. She was still very alert but her spine and legs had stopped working so we had to put her down. She was scared and shaking and I almost backed out of it but my husband reinforced that it was not fair to her. She camped with us her whole life. I brought her home at 9 weeks of age and she traveled from West Virginia to California and from Maine to Florida. Camping this year will not be the same without her. She was the sweetest dog to ever set foot on this earth. I only heard her growl twice in her life and both times she was protecting me. Motaki is an Indian name and means “shadow”. I named her this because she was very dark black when she was little but she followed me everywhere I went until she could no longer get up and then I would help her get to her feet so she could follow me. She lived up to her name in more ways than one. I wish she had been ready to leave but she wanted, I believe, to stay with me which made it even harder to let her go. I feel guilty and wish she were still here with me. I wonder a lot if I let her go too soon. I try to think about all the fun times we had and how beautiful she was and how her poor body had aged so much in the last year of her life but guilt is a hard thing to get past. drag each other across the floor because neither one would let go. They finally managed to rip the hot dog to pieces and even then still wanted to play with it. I finally threw the thing away because I was afraid they would choke on it. As a puppy she would chew on my shoe laces and only my shoe laces. She never chewed on the shoes or anything else. I could leave food on the edge of the table or counters and leave the garbage out and she would never touch it. She was such a good girl. I would go down to the basement to work and many times I wanted both dogs to stay upstairs because I didn’t want them to get dirty in the unfinished basement but within minutes they would both come running down the steps to where I was. I couldn’t figure out how they were getting past the basement door. You did not have to turn the door knob because it was broke but you had to pull the door open and it just didn’t make sense. The older dog was always the first one down so I thought she was hitting the door until it bounced open and then come down. My husband one day was asleep in the recliner in the living room when I went downstairs. He said he woke up to see Motaki stand up on her back legs and put her front paws over the door knob of the basement door and walk backwards to pull the door open at which point Alex ran down the steps first. Case was solved. Thank you all for your kind words and encouragement. It has been a hard month and just reading your comments brought many tears again. I still miss her terribly and wish she were still here with me. I try not to look back and say "What if" but it is hard not to. They say time heals and I hope that is true but when I die, I hope she is right there in front to meet me. Thank you again for being there. Your story brought tears to my eyes. The LOVE of a dog is Special and some people just don't get it. Your Motaki gave you both unconditional LOVE. You had to make the unselfish decision of your life, its hard because you Loved her so much and want her here with you but it's "her time". She had a wonderful and full life. We had to make the same decision like you for our Black Lab, Ebony 12 1/2 years old and 2 weeks later God sent us a beautiful GSD puppy MIA, she is now 2. Your Motaki will always be in your Hearts like Ebony is in ours. The pain is so great and emptyness is unbearable but the Love and the Joy they give us out weighs it all. When you think of your Motaki or see her picture shed a tear is OK, but those tears will turn into a Smile and she is still protecting you from Heaven. What a story and more than that this sounds like a fantastic friendship. There is something very moving about being so close with your dog. It's nice to know that although you are extremely sad you have felt blessed fro your time together. Mrs/Miss Christina Rea: In reference to My Lovely Motaki, You Will Be Missed. March 31st we too lost our Lab of 14 years. Pepperj was loved and cared for like a King but when the time came we had no say in the outcome. Prior to Pepperj we lost one other Lab and 4 German Shepherd Dogs each under a different group of circumstances. I now have 3 German Shepherd Dogs and one is nearing her time. 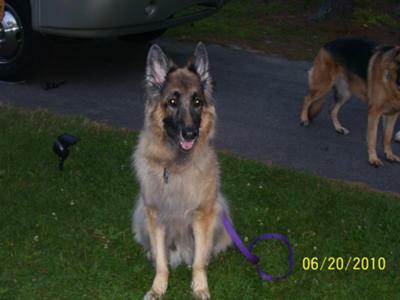 Our Princess (GSD) lived to just days shy of 18 and my beloved Stanley (GSD) was 10 when he was killed. My point here is we can prolong death only. When the time comes God will take that decision out of your hands. We choose to put our best friends down as to avoid their suffering but God chooses the path. Motaki was beautiful in the Earth World but now her body is healed and she shares Heaven with the rest of the Angels. Her Spirit will be with you in your heart and some day you and Motaki will re-unite with your other Fur-children awaiting you in Heaven. Christina, you have done nothing wrong. You done as God commanded you to do. Many people tell me that my thoughts are dreams and can't be proven. I say, no one can prove otherwise. I agree our pets are not in God's image but they are of God's creation. For what ever reason is the word "DOG" spelled backwards "GOD"! Lovely Motaki, You Will Be Missed here on Earth but while on Earth Christina was your loyal and loving caretaker chosen by God. Await your beloved Christina with open paws when she too crosses the RAINBOW. I would like to say , how very sorry I am about Motaki. Also, I wish that I could give you a hug right now. We lost our German Shepherd, Phoebe, on October, 13, from Cancer. She was 12 years old. We had adopted Phoebe, from a local animal shelter, 7 years, previously. We were her 4th owners , at that time, through no fault of Phoebe's. We loved her so very much , & was so hard. We hsd a vet come to our house to help. I know that was a hard decision, for you to make. Motaki seems lkke she was very special friend, but, she now lives on in your hearts , mind, & spirit. We now have a 9 month old Germsn Shepherd , Chloe. She has the same mannerisms as our Phoebe. I hope you & your husband are doing okay.